He went to college in Eugene, Oregon with the intention of becoming a journalist but after graduating he was unable to find “a job writing very hard-hitting, interesting pieces that would really make some sort of difference.” He returned to his homeland of Malta for a year and got a job writing travel guidebooks for a local publisher. As a way to make money he came up with the idea for the publisher to print six of his 64 page romance comics written in the local Maltese language. 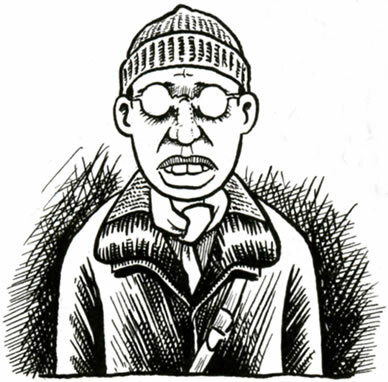 Returning to the USA, he published 15 issues of a free, humor magazine called the Portland Permanent Press showcasing his own work and that of other cartoonists, which he co-edited with his business partner, Tom Richards. Lack of money forced that publication to fold and Joe took a job as a staff news writer at Fantagraphics Books for whom he would go on to edit the humor/satirical magazines Honk! and Centrifugal Bumble-Puppy. Joe’s own work was the focus of his next title, Yahoo!, which included prime examples of his now trade mark ‘cartoon journalism’ approach to comics and his powerful commentary on modern warfare. Between 1993 and 1995, Joe wrote and drew nine issues of Palestine which documented his two months spent in the Occupied Territories in the winter of 1991-92 and which shows the human effects of the Israeli occupation and subsequent intifada that goes unreported in the mainstream media. 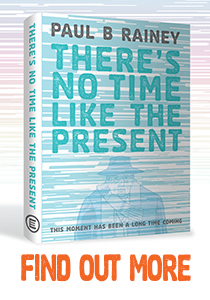 The series was a major success and won Joe the 1996 American Book Award. 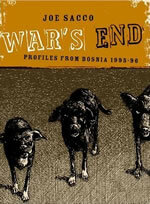 His concern about the ethnic cleansing in Bosnia and the lack of intervention by the international community led him to want to document the lives of people suffering in, as well as the politics behind, the Yugoslav wars of the 1990s, during which an estimated 100,000 to 300,000 people died. “...my stomach was in knots, basically, about it.” In 1995-96, Joe traveled four times to Bosnia where he established intimate ties and close friendships that continue to this day. Back in the US, Joe has produced four harrowing accounts of his time in Bosnia, Christmas With Karadzic, Soba, Safe Area Gorazde, and The Fixer. Rafah, a town at the bottommost tip of the Gaza Strip, has long been a notorious flashpoint in the bitter Middle East conflict. Buried deep in the archives is one bloody incident, in 1956, that left 111 Palestinians shot dead by Israeli soldiers. Seemingly a footnote to a long history of killing, that day in Rafah - cold-blooded massacre or dreadful mistake - reveals the competing truths that have come to define an intractable war. In a quest to get to the heart of what happened, Joe Sacco immerses himself in the daily life of Rafah and the neighboring town of Khan Younis, uncovering Gaza past and present. Spanning fifty years, moving fluidly between one war and the next, Footnotes In Gaza transforms a critical conflict of our age into intimate and immediate experience. 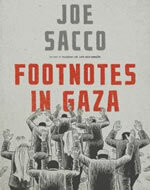 In late 1991 and early 1992, Joe Sacco spent two months with Palestinians in Jerusalem and the Occupied Territories, traveling and taking notes. Upon returning to the United States in mid-1992, he started writing and drawing Palestine, which combined the techniques of eyewitness reportage with the medium of comic-book story telling to explore this complex, emotionally weighty situation. 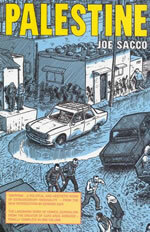 Quoted accounts of detention, harrastment, torture, land confiscation and killings, and the pernicious mood of powerlessness are given added dimension by Sacco’s scrupulous renderings and freewheeling internal commentary. 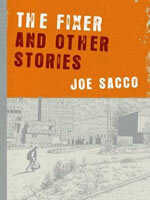 More graphically than any TV or press report, Sacco grounds us in a lived reality. The trouble with first hand personal-account comics is that the authors generally do not go to much trouble to make their lives interesting enough. Enter Joe Sacco, to whom the above does not apply. Some mighty serious journalism going on here. In Joe Sacco’s Palestine, the autobiographical comic book reaches beyond everyday trivia to embrace the travel documentary. Utilizing a masterful array of visual devices and employing consummate draftsmanship, Sacco details life in the Occupied Territories with sensitivity, insight, and a fine eye for moral ambiguities. Highly recommended. In late 1995 and early 1996, cartoonist/reporter Joe Sacco traveled four times to Gorazde, a UN designated safe area during the Bosnian War, which had teetered on the brink of obliteration for three and a half years. Still surrounded by Bosnian Serb forces, the mainly Muslim people of Gorazde had endured heavy attacks and severe privation to hang on to their town while the rest of Eastern Bosnia was brutally ‘cleansed’ of its non-Serb population. But as much as Safe Area Gorazde is an account of a terrible siege, it presents a snapshot of people who are slowly letting themselves believe that a war was ending and that they had survived. 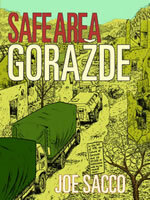 I’ve just read Joe Sacco’s Safe Area Gorazde, about the Bosnian mess. Do yourself a good deed and pick up a copy. The gods will shower all kinds of awards upon this mighty book. How much does the nightly news cost? A carton of cigarettes maybe, or a pair of Levis. When shells are falling and Western journalism is the only game left in town ‘fixers’ are the people who find war correspondents the human tragedies that make news editors happy. It’s a dangerous occupation, a little amoral and a lot desperate. Joe Sacco returns us to the dying days of the Balken conflict and introduces us to Neven, a fixer, looking to squeeze the last bit of profit from Bosnia before the reconstruction begins. Thanks to Neven, Joe discovers the crimes of opportunistic war lords and gangsters who run the countryside in times of war. Joe Sacco recounts two stories from his first-hand experiences of the recent Bosnian Serb conflict. In Christmas With Karadzic, Sacco tracks down, and meets, one of the most hated and sought after Bosnian Serb war criminals. Soba is a popular man about town who finds himself planting land mines and fighting in the trenches surrounding his home town of Sarajevo. Despite his harrowing experiences in this brutal urban war, Soba upholds his reputation as a hard-drinking, hard-living man.